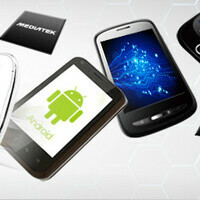 Until recently, MediaTek was known primarily for its low-cost, low-performance SoCs used in cheap, white-box smartphones. However, things have changed since then. Take the Acer Liquid E2, for example – it is powered by one of the company's latest quad-core chips and its performance is quite decent for its class. Yet MediaTek has even better silicon in stock, although it will be a while until we actually see it in action. The MT6592 is an upcoming octa-core system-on-chip (yes, it really has an 8-core CPU) that will be ready to be tested by manufacturers by the end of July. Running at up to 2.0GHz, the chip will offer 8 Cortex-A7 processor cores made using 28nm tech. Some say that the MT6592, which scores over 30 000 points on AnTuTu, should easily outpace Samsung's octa-core Exynos 5410 SoC in terms of performance. But while samples of the MT6592 will be ready to ship in July, handsets powered by it aren't expected to launch earlier than December of 2013. The top Chinese smartphone manufacturers are likely to be the first with such devices on the market. Cortex-A7 ? Why not Cortex-A15 ? I'm guessing it would be too powerful with 8 A15s, to the point where it really becomes insignificant that a higher price would not justify. Cortex A15 is simply not power-efficient enough to be used alone in a smartphone, and my guess is that efficiency was a prime concern for MediaTek, but if used in a big.LITTLE configuration (four A7 cores and four A15), it'd make a lot of sense. Why not use big.LITTLE is an interesting question, though. 1. According to ARM's website, it's not possible to use more than 4 A7 cores on one SoC. 2. Even if they get all 8 cores to work they will work on the same voltage plane. Which means that if you stress even one single core to 100% the entire herd of cores will go to 100% even though they aren't being used. 3. It will be just like AMD's Bulldozer. They will be excellent at heavily threaded tasks, but in web browsing, games, etc. they will be poor performers. 4. Cortex A7s aren't designed for such high clock speeds which means power consumption will be high. 5. Cortex A12 would have been a much better choice. 6. I think they will use 2 quad core clusters just like Samsung's Octa. One cluster operates at 1.2 to 2 GHz while the other cluster operates upto 1.2 GHz. 1. Actually it is possible to use more than 4 cores in one SoC. But they will be put in different clusters. 2. This means the two clusters will operate on independent voltage planes which will sort of mitigate the problem. A7 has best per watt performance...that's why MT ditched A15...with 8 cores...apps optimized to get benefit of multi-core cpu...will get huge benefit from it. Performance isn't determined by just whether a processor is OoO or IO type! A7 does, like... -Integrated L2 Cache -Lower L2 Latency (10 Cycles) -Improved OS Support for L2 Maintenance, due to simplified software control -Designed with a lower power approach, up to 5x more efficient than Cortex A8 -Improved branch prediction -Improved memory performance -64b Load Store path, improves integer and NEON performance -128 AMBA 4 buses improve bandwidth -Increased TLB size (256 entry, up from 128 entry for Cortex A9 and A5) -Increased performance for large workloads like web browsing -Seamlessly compatible with Cortex A15 (big.LITTLE) Add all of those up and they easily start making up for where it would otherwise be weaker. cheap about to get better yahhhhhh! Well well.. I actually proposed an 8 core, high clocked, A7-based chip year ago! Still not going to be as strong as the current quad core A15 processors. Perhaps a bit more energy efficient. I don´t really find it a good idea. The single thread performance is not going to be even near the current A15 cores. Probably another marketing stunt from Mediatek just to add the word Octa to the list after adding the Quad one. Why? Samsung has had problems producing there octa, and And tech posted a article a while ago about how it wasn't has effective at saving power has it should be. Honestly, it seems ARM needs to fix problems in the designs of the chip (has Samsung only leases the ARM designs). But this is an actual 8 core CPU, not a double quad core.